The Internet market is underdeveloped in Mauritania. The country has low broadband Internet penetration (18%); most of the Internet connections are via LTE networks. Mobile Internet is not the best solution for traffic termination, but it is possible to connect ADSL. How much will it cost the terminator? 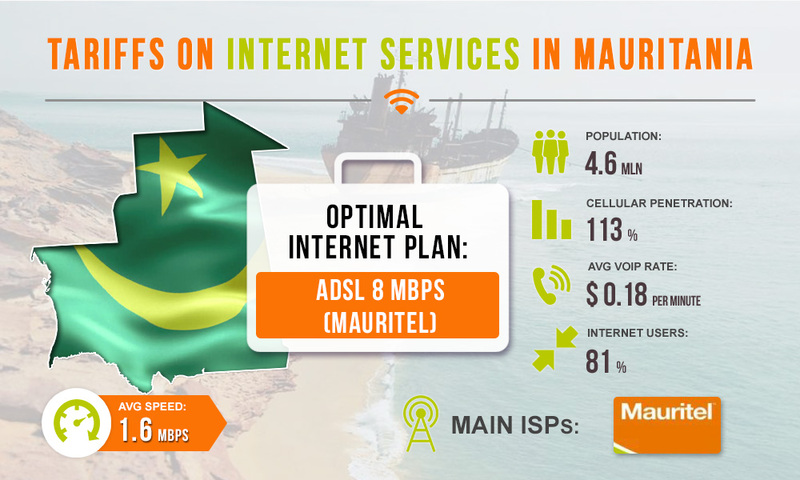 The Government of Mauritania is taking steps to improve the market situation by upgrading the national baseline network and attempting to connect to international cable. Nevertheless, the state of the Internet services sector remains unsatisfactory, and the connection prices are high. This is also due to the Mauritel monopoly. The average speed in Mauritania also leaves much to be desired - it is about 1.6 Mbps. However, Mauritel offers connecting to higher speeds by choosing a suitable Internet plan at a fixed cost. 2 Mbps. Speed - 2 Mbps, price - $28 per month. 4 Mbps. Speed - 4 Mbps, price - $52 per month. 8 Mbps. Speed - 8 Mbps, price - $86 per month. 12 Mbps. Speed - 12 Mbps, price - $138 per month. To work in the field of voice termination, choose the ADSL 4 Mbps or 8 Mbps package (depending on the number of channels in one location). A monthly expense of $52 or $86 won’t hit you in the pocket hard enough, with average voip rates calls in Mauritania being about 18 cents per minute.